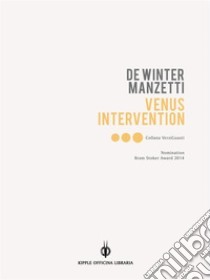 Venus Intervention has been nominated for the Bram Stoker Awards 2014 (superior achievement in Poetry Collection) and for the Elgin Award 2015. The poem "The Man Who Saw the World" has been nominated for the Rhysling Award 2015. A gothic and disturbing poems collection, an exciting journey into the nightmare that will leave you breathless. Words to be read more than once, to hear again the sound of the emotions that rotate inside the magical kaleidoscope imagined by the authors. You will never be the same again, after being caught by that Venus, in all her forms. Una raccolta di poesie gotiche e inquietanti, altamente emozionali, per un viaggio da incubo che vi lascerà senza fiato, costringendovi alla rilettura e a seguire le continue rotazioni di un magico caleidoscopio (in lingua inglese). Corrine De Winter is a Bram Stoker Award winning poet and author who has won numerous awards for her writing from the New York Quarterly, Triton College of Arts and Sciences, and The Rhysling Science Fiction Award. Her work has been applauded by such luminaries as William Peter Blatty (“The Excorcist” author) Tom Monteleone, Thomas Ligotti, Nick Cave, Stanley Wiater, James Sclavunos, Heather Graham, Harry O. Morris, and others. William Packard, former editor of the New York Quarterly, was a mentor, publishing De Winter’s work early on and inviting her to write “The Present State of American Poetry,” a regular feature in the journal. At Packard’s invitation she read her poetry at the New School and continued a rapport with Packard until his passing . Packard was a big supporter of Charles Bukowski and De Winter was published with him several times in his last years. De Winter won the Bram Stoker Award in 2005 for her collection “The Women At The Funeral.” Five of her collections have been Stoker Nominated. Among her publications, the poems collections: "A Dark Ride", "The End of Desire", The Women at the Funeral", "Touching the Wind", "Valentines for the Dead", "Virgin of the Apocalypse". A naturalist, philanthropist, paranormal expert, artist, and the founder of “Small World Fund For Children ,” De Winter lives between this world and the next. Alessandro Manzetti is a horror, science fiction, weird fiction, and dark poetry writer. His published work in Italian includes novels, long stories, short story and dark poem collections, as well as many short stories published in anthologies. English publications include The Shaman and Other Shadows, Venus Intervention with Corrine De Winter as co-author, Dark Gates with Paolo Di Orazio as co-author and stories and poems which appeared in both print and online USA and UK magazines and anthologies. His works has been nominated for the Bram Stoker Awards 2014, the Rhysling Award 2015 and the Elgin Award 2015.